MAI KHAO: For the past three weeks, some 100 staff of the Blue Canyon Country Club (BCCC) have spent their mornings protesting in front of the golf course, claiming its new management has threatened them by placing them on indefinite, unpaid leave. The management refutes their claims, however, saying the work suspension is only temporary and part of management restructuring, and that all workers continue to receive their salaries. The Appeals Court in Bangkok on February 22 overturned an earlier ruling by Phuket Provincial Court and awarded control of Murex Co Ltd, BCCC’s holding company, to a group of Thai shareholders aligned with Singaporean investor Sia Leng Yuen. The Phuket Court had earlier ruled in favor of a rival group of shareholders led by Rawat Chindapol, a Phuket native and a founder of both BCCC and Murex. 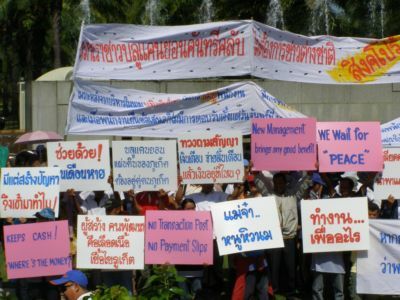 Protester Prasit Intarat told the Gazette that on February 25 more than 100 of the club’s 400 employees were put on forced leave without pay. Murex announced they would not be paid for February, he claimed. The protest has nothing to do with the legal dispute between the old and new management of Murex. The staff are happy to work for anyone who will pay them and treat them fairly, K. Prasit said. The 100 protesters include personnel ranging from caddies to department heads, he added. The protesters have been standing on Thepkrasattri Rd in front of the golf course for a few hours every morning, bearing a variety of signs in Thai and English. One of the sign reads: “Mommy, I am hungry for milk”; another: “We the employees of Blue Canyon don’t want foreign management”. “On February 25, we asked the executive board if we could resume normal work, but we have not received an answer. We have also asked for help from the Phuket Provincial Labor Office (PPLO), but we have not heard anything from them either,” K. Prasit said. “I just want to know how long we have to wait. They said they will not pay us because they were just reinstated on February 22. We need the management to be responsible because the staff members have monthly bills to pay. All of the staff who have been put on unpaid leave are really suffering, but the executive board doesn’t care. “We are holding a peaceful demonstration and we don’t want to discredit the club. Each day we go home and come back the next morning to ask for fairness. I think they should give us some type of answer,” he said. If a suitable solution was not found soon, the protesters would file a complaint at the Damrongtham Center at Phuket Provincial Office, he said. In a fax received by the Gazette from Murex, the company’s Public Relations Consultant Jaroon Chujan sharply refuted the protesters’ claims. The work suspension is only a temporary measure during restructuring and all the payroll employees have continued to receive salaries and welfare benefits. Murex had never received complaints from BCCC employees about failure to receive salaries, he wrote. On February 29, Murex management posted a notice instructing any staff who had not received payment to contact the human resources department. At that time, none had, he wrote. Murex management received a list of six proposals from staff representatives on March 7, but none of these included a request to return to work. This supports the company’s claim that they were never laid off in the first place, he added. When Murex met with staff representatives on March 7, negotiations moved forward and both sides signed a memorandum of the issues to be resolved. These details were later altered by the staff members and then distributed to the media, K. Jaroon alleged. Management negotiated with the protesters in good faith, including managerial matters not directly related to their employment contracts, he wrote. Other staff demands included a promise not to lay off, suspend or change the work duties of existing staff for a period of three years, he noted. The company had not ignored the workers’ request for across-the-board pay increases ranging from 1,000 to 1,5000 baht each per month, but the matter was still under negotiation through the Phuket Provincial Labor Office (PPLO), he said. PPLO chief Anuchon Varinsathien told the Gazette that the workers issued their demands during the March 7 meeting attended by PPLO officials and four representatives each from both staff and management. Those negotiations failed to reach an agreement, so another meeting was scheduled for tomorrow, March 18. “I don’t understand why the protesters said they didn’t get any help from us. We can’t force the employer to meet the workers’ demands. All we can do is help them try to negotiate an agreement in terms of salary and benefits. But they can’t ask us to get rid of the [new] management for them,” he said. Despite the current turmoil, the Gazette notes that Blue Canyon remains open for business as usual.